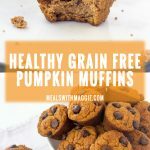 These healthy grain free pumpkin muffins are gluten free, oil free, low in carbohydrates, high in fiber, soft and moist. They can be made into mini muffins or frozen for later use. Happy fall, everyone! Sunday marked the first official day of fall. As much as I am sad to see summer go, I am excited for Halloween, fall TV (I know) and all the beautiful fall colors in Michigan. Oh and of course, can’t forget about tailgating! 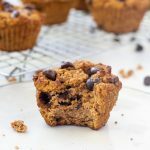 This week I am happy to bring you these healthy grain free pumpkin muffins. I tested this recipe out about 4 times to get it right and I am so proud of them. Earlier last week I took an Instagram poll to see if people liked mini muffins or regular sized muffins. Surprisingly, most said mini muffins! I have a mini muffin tin that you can find relatively inexpensive for under $12. It’s nice if you are bringing muffins to a party or gathering and you want a high quanity. 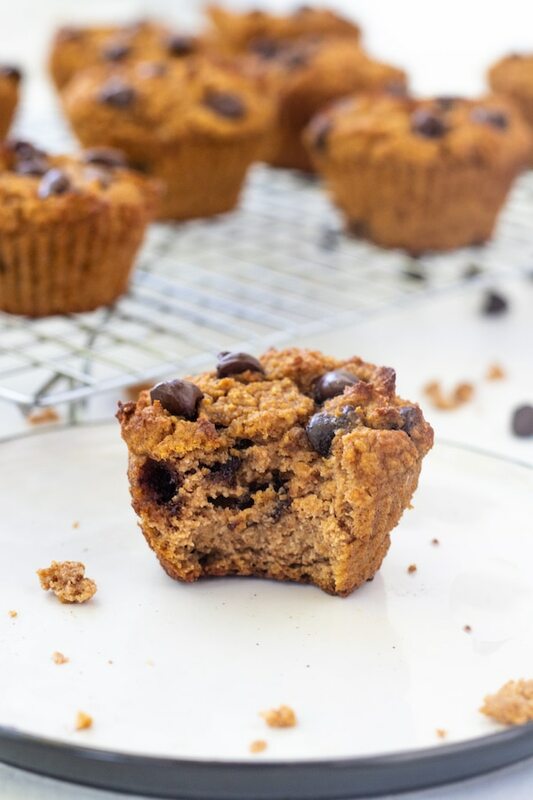 They are little bite sized muffins that are easy to pop in your mouth and go. So I adapted this recipe to make either variety you choose, regular size muffins or mini. 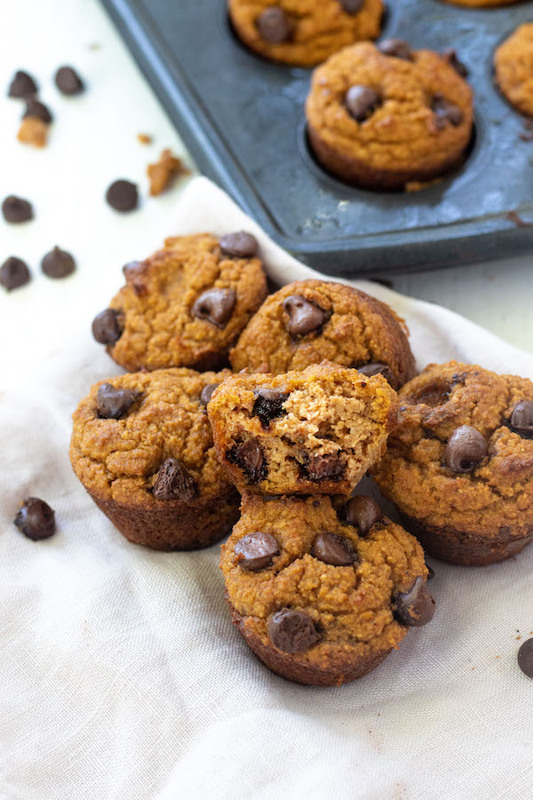 Another question I asked was if people preferred chocolate chips on top or mixed throughout a muffin. Almost 90% said mixed throughout, but I got a few results showing both! I am here for it, bring on the chocolate! Also if chocolate isn’t your thing, feel free to swap in pecans, walnuts or cranberries. Pumpkin: high in vitamin A, C, fiber and vitamin B6, which is essential for our metabolism and protein synthesis. Low in sugar: 1 mini muffin provides only 6g of sugar. The only added sugar comes from the pure maple syrup, which adds just the right amount of sweetness. High in healthy fats: I love cooking with almond flour! It makes the product so soft. If you are looking for other ways to use your almond flour check out my gluten free lemon blueberry muffins or these soft oatmeal chocolate chip cookies. Low in carbohydrates (if you’re into that kind of thing): Each mini muffin only has 8g carbohydrate. If you make regular size muffins, it contains ~15g that’s only 1 carbohydrate choice for diabetics. If you want to make a double batch and freeze half for later there great thawed out in the microwave for about 30 seconds. They are best stored in an airtight container in the fridge for up to 1 week. Do not leave these out of the refrigerator for more than 1 day because they will spoil! Preheat oven to 375F, grease a muffin tin and set aside. Combine wet ingredients in a small bowl, mix until well combined. Combine dry ingredients in a deep bowl and add wet ingredients. Stir until well combined then add in chocolate chips. 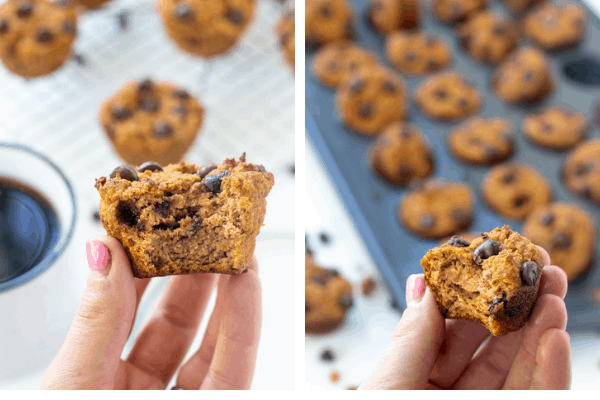 Pour into greased muffin tins and bake for 18-22 minutes or until toothpick runs clear. If you are making mini muffins, I recommend baking for 18 minutes as they will cook faster. They do freeze well, just defrost in the microwave for 30 seconds prior to eating. 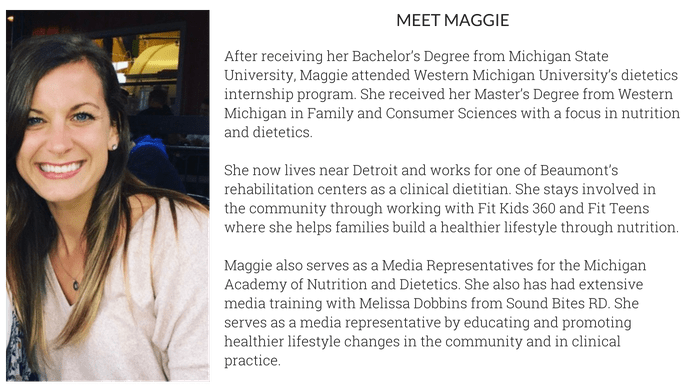 Don't forget to 'Pin it' on Pinterest and follow Meals with Maggie! This page contains affiliate links meaning I do make a small profit from your purchases. Your price is not affected by this commission. 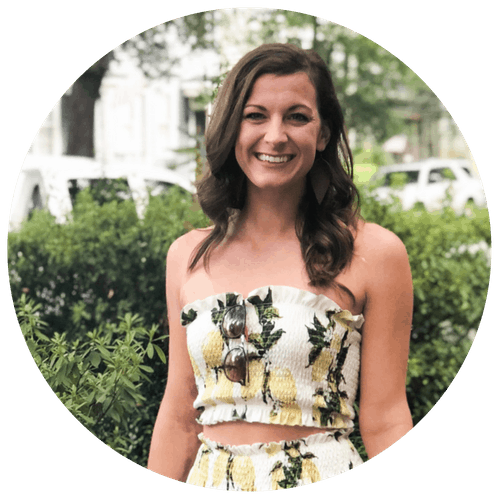 I am a participant in the Amazon Services LLC Associates Program, an affiliate advertising program designed to provide a means for me to earn fees by linking to Amazon.com and affiliated sites.I only promote products that I use in my own kitchen from companies I trust!